Living four miles and 1,500 vertical feet from town is spectacular and secluded but sometimes makes training a little more difficult. The snow has been gone from the road for awhile so I haven’t been able to skin right from the garage forcing me to head to town to train. 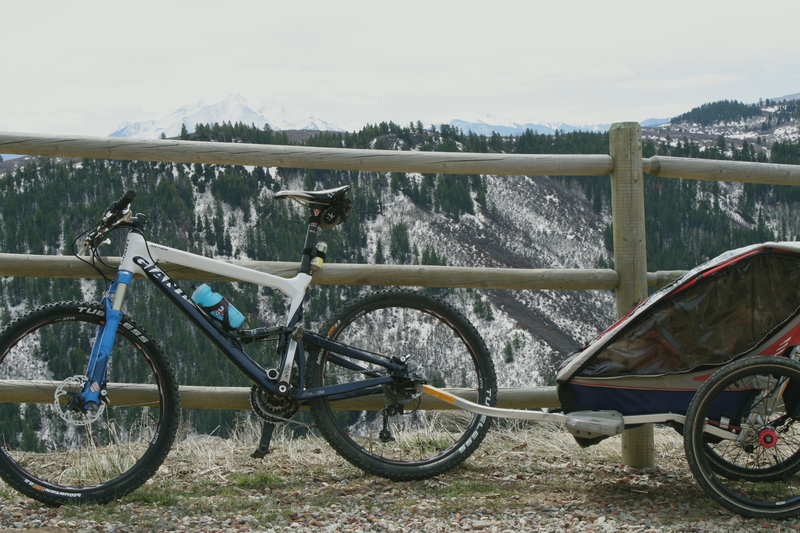 This morning I decided the road was dry enough for the first mountain bike/Chariot ride from the house for the season. Juniper was very excited to bring as many toys as I would allow making the climb back home as heavy and difficult as possible for me. I cut her off with the dancing Elmo that seemed like it may put me over the edge. After a quick coast down the road and a stop at our friend Joy’s house, we started the ascent home. For some reason this ride always seems daunting to me. If this were the fire road climb to a great singletrack I wouldn’t think twice about it. It’s somewhat steep considering we drive it year round and it isn’t some off the beaten path 4 wheel drive path. I think the hardest part is that I can see the house the entire ride and it always feels like it is far up the hill. And the Chariot adds nice weight and drag to make it an even tougher hill training ride. Although I was worried this was a little more than I could handle right now, we made it home (we didn’t have too much choice) in almost the exact amount of time we did last summer. I got some hope that I haven’t lost quite as much fitness as I thought I had. One more test next week to check for some parasites in the little bowels and Celiac disease. In the meantime, I’m trying to train as if I feel normal and strong. We loved your stop over! You are such a tough mama!